Dave Stambaugh bought his home in Santa Clarita, Ca. in 2005 for $845,000 just before the real estate market collapsed, but 11 years later he found a quarter-million-dollar pot of gold in his backyard, pictured above. Tower techs frequently talk about ‘tower treasures’ that they find at a cell site left by previous crews, from hand tools to rigging blocks, and a host of other equipment. But it’s rare for a homeowner to discover that someone had built a multi-tenant tower designed for someone else and left it installed on his property, while another property owner benefited from lease revenues. When Dave Stambaugh bought his home in Santa Clarita, Ca. 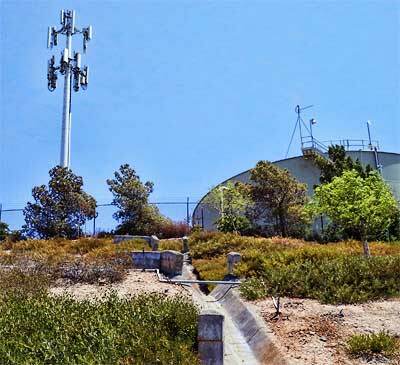 in 2005, he was aware of a monopole cell tower further up the canyon next to a Newhall County Water District water tower on water district property. And as is usually the case where ubiquitous cell towers have become part of the landscape, it is possible that Stambaugh barely noticed the telecom utility structure after a number of years. 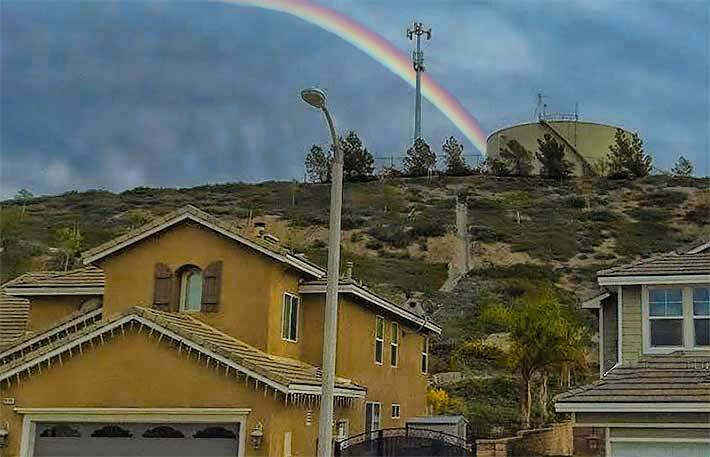 The homeowner had no idea that the property that this cell tower was built on was his. He might be getting a quarter to half-million-dollar windfall and a monthly check from Crown Castle. However, today, it’s likely that Stambaugh pays almost daily attention to the Crown Castle monopole whose mottled gray galvanizing is taking on a gold patina since it appears that the tower was built on Stambaugh’s property and it’s expected that he’ll receive at least $235,000 from Newhall Water, possibly more. According to the Santa Clarita Gazette, Stambaugh received a Fed Ex package from Crown Castle last January informing him that the tower appeared to be on his property and they wanted to pay him for it. Stambaugh said Newhall Water officials visited him shortly thereafter at his Mammoth Lane home to negotiate a settlement, reported to be $235,000. But Stambaugh refused, stating that he wants 50 percent of the monies collected between 2005 and July 2016, plus attorney fees. He believes, according to documents he obtained, that the revenues run into seven figures. The tower was built in 1996. Crown Castle Real Estate Manager Cori Aluli-Chott said in an email, “Crown Castle is working closely with Mr. Stambaugh and Newhall County Water to resolve this issue. We look forward to a positive outcome for everyone involved. 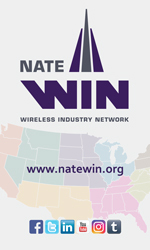 Crown Castle is committed to enabling the necessary daily mobile connection that the Santa Clarita community requires to conduct business, keep in touch, and stay safe,” according to the article. Stambaugh’s payday could have been a few years ago. In 2013, Crown Castle called him three times about the tower, but each time he hung up, thinking it was a scam. Newhall Water said they are trying to reach a settlement and will further discuss it at their monthly board meeting to be held Aug. 11.